Large house for sale with 5 lettable rooms and private living space. When you think of Normandy (Lower-Normandy Property Guide, Upper-Normandy Property Guide), think of lush green fields, of apple orchards bursting with rosy red apples and flagons of cold, strong cider standing by for the thirsty pickers' refreshment. This idyllic countryside scene is echoed by the equally idyllic seaside scenes, where the silver beaches and clean sea water invite you to relax and enjoy. The Normandy fishing harbours are straight from a picture book, with colourful boats galore and the catch of the day being dragged ashore to be bought by the eagerly awaiting restaurateurs and shopkeepers. If you still need to be convinced that Normandy is the place to own property in France, then you'll find our top ten reasons below. Normandy is a part of France that lies very close to Britain, just across the channel, that is often overlooked by people who are passing through (French Connections), beginning their journeys east, west and south, deeper into France as they search for their perfect holiday home or perhaps, a whole new life (Life in France). Everyone who travels by ferry to France is familiar with the port of Calais (Calais Property Guide), and indeed it is through this port that most of us have passed at some point during our love affair with La Belle France and all things Française. The trouble is, most of us just do exactly that, and pass through, instead of pausing to discover property in the very lovely region that is almost on the doorstep of Britain. Normandy's beaches, once the site of fierce fighting, are now restored to their former natural glory in most cases, and are some of the most beautiful and family friendly in France. In fact, the department of the Manche (Manche Property Guide 50), has a very high number of Blue Flag approved beaches, meaning that the water and the beaches are extremely clean and safe, and pollution free. For superb bathing take a look at Brehal beach, near the beautiful town of Mont St Michel, or perhaps try elegant Étretat (Étretat Property Guide), with its famed alabaster (milky white) water... awarded the Blue Flag with a mark of good quality bathing cleanliness. Normandy is a very beautiful region. The Norman countryside is gentle and pretty, with many rural areas appearing little changed for centuries. Apple orchards, silver beaches, colourful fishing boats and bustling harbours... who could want more? And atmosphere... Normandy has it in spades! Farmers markets and general markets are held in the towns and villages as in days gone by, and these are a source of delight to those ex-pats (and locals too!) who never tire of their charm and amazing fresh produce. The villages and towns of Normandy are absolutely glorious. Whether or not you are considering buying property or holidaying in Normandy, you really shouldn't pass through the region without casting an eye over the amazing town of Mont St Michel, built on a tidal island and rising up out of the sea looking like a mythical kingdom of Neptune. Lovers of architecture and pretty villages will also love Èvreux (Évreux Property Guide), with its ramparts and fountains; Fécamp, with its blend of architectural styles including traditional, modern and art deco; or perhaps the beautiful and historic city of Rouen (Rouen Property Guide) could be right up your street. The port towns are fascinating architecturally too, with the influences of the past unfolding before your eyes in the varied architectural and period styles. Normandy is great for families because of a number of attributes that add up to a family friendly region. The safe, clean bathing beaches, the gentle climate and way of life are all excellent for young families. The easy access from the UK prevents the parental nightmare of long journeys with infants on board ("Are we nearly there yet?") and ferry travel and train travel are also far more comfortable ways of getting to France with young children than battling to contain them in their seats on an aeroplane. 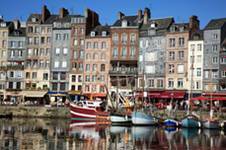 Normandy welcomes families, its towns and villages are known for their excellent educational facilities and schools (French Education System - Schools in France). There are plenty of sporting activities too for the teens whose need to be kept occupied is legendary, so even at this "difficult" age a move to Normandy can be a positive thing. And on the subject of families, there is another important point to consider. Many families who want to move to France are thwarted by the difficulty of leaving behind elderly relatives, who in their turn are upset at the prospect of not seeing their children and grandchildren regularly. Normandy is so close to the ferry ports and train stations of the UK that even this becomes much less of a problem, and all the attributes that commend Normandy to young families also make it admirably suited to the elderly, should they decide to make the move alongside you (Retirement in France). The history of Normandy needs no introduction. We have all heard of William of Normandy, aka William the Conqueror whose Norman troops changed British history for ever that fateful day on Hastings hill back in 1066. More recent, yet just as well known, history brings us to the beaches and battles of the two world wars, where Normandy was the scene of bitter fighting, and of tragedies and triumphs. We all know of the heroism of Dunkerque and of the Normandy Landings, and even those of us who have no great passion for history should, perhaps, visit the scenes of these events to remember those who repelled the invading forces and made their ultimate sacrifices to allow our world to become the place it is today. For schoolchildren too, or students of modern history, visiting these sites can vividly bring history to life in a way that books and films never could. Normandy is truly a paradise for the foodie, with gourmet treats to be sampled all over the region and some of the best fresh fruits of the sea and of the land to be found in France. Must try foods include crêpes and galettes, fresh seafood and anything made with apples. Local speciality drinks include Normandy cider, of course, and the warming and wonderful Calvados, or apple brandy. Normandy is a wonderful place to seek a property in France, whether you are hoping to make a permanent move, or whether you are looking for that perfect holiday home for those precious weekends and longer breaks. Recent government investment in the region has improved its appeal beyond measure and its cities, towns and countryside are all becoming more and more attractive thanks to this injection of cash. Normandy has played second fiddle to Brittany as a favourite destination for the Brits, but in recent times people are beginning to take a better look at what this beautiful region has to offer as Brittany has become more and more expensive. 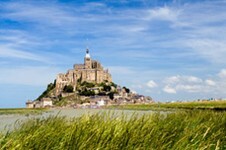 What sort of property is available in Normandy? In Normandy you can still find great properties to renovate (House Renovations in France) without spending a fortune. It is still a very realistic proposition to find a lovely old farmhouse which needs work, complete with outbuildings and land (Building or extending property in France). In much of France these days it is almost impossible to purchase this type of property unless you have a lot of money to spend. Normandy also has more than its fair share of those glorious half-timbered houses (Property in France - Types of houses in France) that epitomise French country style. So there you have it. Ten simple reasons why Normandy is worth more than a second glance for property seekers. So next time you get off the ferry at Calais or Le Havre, book a hotel and stay a while... you won't regret it! Normandy property - Top 10 | © 2019 Financial Systems Limited and its licensors. All rights reserved. | No unauthorised use of content permitted.